When Pinterest burst onto the social media scene, there was a ripple of excitement among the GeekMoms. Curating shiny pictures, ordering and pinning things — yes, this pertained to our collective interests. We practically fell over one another to get invites. But in the last few months, we’ve all started to notice some trends that are, how shall we say, completely and utterly annoying. 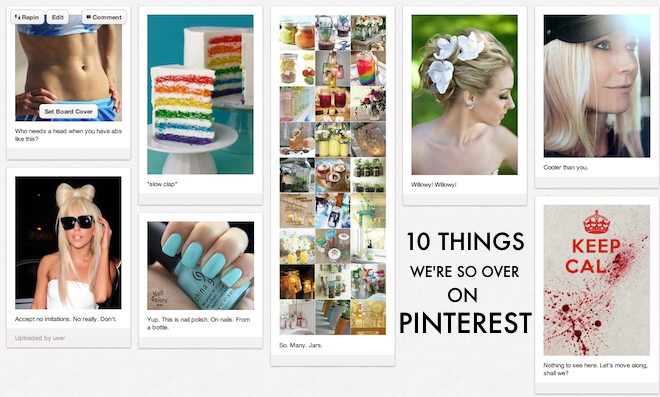 So we thought, in the spirit of Pinterest, that we’d share. From hairdos and hairdon’ts to unexpected abs, here’s our top ten list of things we’re so over on Pinterest. 1) Nail polish. It’s got a ubiquitous pose. The hand, tilted just so. The nails, aligned just right, clutching that marvelous bottle like Excalibur pulled from the stone–no, no more, just… stop. Half the nail polish shots we see are pretty much straight off the Sally Hansen shelf (which, let’s face it, we’re all quite capable of); the rest look like you totally did that with your left hand (nailed it!). A small percentage are actually pretty keen (like some amazing geek inspired examples that include multiple TARDISes or Pac-Man, etc.). But by and large, we’re reaching for our nail polish remover. For our eyes. 2) Misfiled pins. Chalk it up to our obsessive compulsive tendencies. But why in the world are nail polish poses showing up under Food and Drink? Or Nature? Not to mention those truly annoying before and after shots of “Look at me I lost 50 lbs. in six months” showing up in just about every category out there (I mean, it’s one step away from the “ridiculously easy tricks to lose weight” ads). Surely there’s got to be a better user-generated way to curate some of this stuff. Not to mention, they really need to improve their search. Seems like Google Search integration would totally be the way to go. 4) Bad links to crappy ads. Because so much of Pinterest is merely about the outside (the shiny pretty pictures) plenty of people have used this to exploit users by hiding links to their online schemes. Take a pair of R2-D2 shoes I pinned, without checking the link. I was later informed that it went to some bunk website selling crap. New to Pinterest at the time, I had no idea the links conveyed like that. I was just sharing because OMG R2 SHOES. I try to be more careful now. But it’s not the first time I’ve seen this, and it still proliferates. We need a way to report this stuff better, don’t you think? 5) Hair bows. Granted, I give Gaga points for this one. She’s a style icon. She can wear a meat dress, or a paper bag, or a Muppet dress and totally get away with it. She’s haute geek. But hair bows on the general population pretty much look ridiculous. Especially on poor little children. This needs to go away, pronto. Along with some of the really, really ugly hair “experiments”. 6) Gwyneth Paltrow. Nothing against Gwyn. I like her, I do. She’s plucky. She’s got some pipes, cool style, and hey, she’s even got her own website, which I dig. I just can’t figure out how no matter what I search for, she shows up. Looking for a brownie recipe? There’s Gwyneth looking gorgeous and making me feel guilty for wanting brownies. Want some ideas for a baby shower? There’s Gwyneth reminding you that her children are cuter than yours. Want some wedding tips? There’s Gwyneth smiling at you to inform you that she’s Mrs. Chris Martin. It gets to a girl after a while. I say let’s counter with a little Tina Fey. 7) Willowy Girls in various poses. This term was coined by our own Laura. You know what I’m talking about. She’s tall. She’s thin. She’s blonde. Her hair is tousled just so. Her dress is flawless, her skin akin to moonlit alabaster. Maybe she’s sharing how to get the perfect French braid, or exhibiting the next must have fashion accessory. Maybe she’s staring your way to entice you to feel terrible about yourself. Whatever reason she’s there, she is everywhere. It’s time for some buxom, regular ladies to own it. Don’t you think? Too much polish and we might as well chuck in Pinterest for Cosmopolitan . 8) Jars of stuff. Hey, look! It’s a jar with glitter on it! It’s a jar with cookie ingredients in it! It’s a jar filled with leaves! It’s a glowy jar! A jar in a jar! A Jar-Jar in a jar! A jar filled with a preserved goat fetus! (Okay, I’ve never seen that last one, and I’ve got to admit that would be kind of cool.) But, let’s have a talk, oh persistent pinners of the magic of the Jar. Jars are containers. See-thru containers. And guess what!? You can put stuff in them. Apparently, on Pinterest, this is a novel concept. Next up: Tupperware! 9) Rainbow cakes. So. It turns out if you add massive quantities of food coloring to box cake in a spectrum of shades, you can stack them up and make rainbow cake. Never heard of that? Wow, you must be the last human on earth. 10) Abs with no heads. Nothing says “you’re a complete and total fitness failure” like the glorious abs of a person you don’t know. It’s kind of intimate, y’know? And there’s something downright off-putting about headless bodies. If I follow your fitness regimen, does that mean I have to forsake my head? Sometimes these are accompanied by lists of how to get these rock bodies, and it always includes uncomfortable sounding positions like a “Russian twist” which, I think, sounds like a delicious vodka beverage. But most of the time it’s juxtaposed against food. You know: Rock hard abs and… seventeen layer cheese lasagne covered in Bearnaise sauce. Perfect Pilates sculpted thighs offset by deep fried brownies slathered in butter cream and ganache. How are we supposed to be motivated when we’re getting these mixed messages? What’s the solution to this pintastrophe? Well, aside from jars full of pickled science specimens, let’s just say I’m open to suggestions.